542 pages | 95 B/W Illus. "This book presents the technology evaluation methodology from the point of view of radiological physics and contrasts the purely physical evaluation of image quality with the determination of diagnostic outcome through the study of observer performance. The reader is taken through the arguments with concrete examples illustrated by code in R, an open source statistical language." "This book will benefit individuals interested in observer performance evaluations in diagnostic medical imaging and provide additional insights to those that have worked in the field for many years." This book provides a complete introductory overview of this growing field and its applications in medical imaging, utilizing worked examples and exercises to demystify statistics for readers of any background. It includes a tutorial on the use of the open source, widely used R software, as well as basic statistical background, before addressing localization tasks common in medical imaging. The coverage includes a discussion of study design basics and the use of the techniques in imaging system optimization, memory effects in clinical interpretations, predictions of clinical task performance, alternatives to ROC analysis, and non-medical applications. Dev P. Chakraborty, PhD, is a clinical diagnostic imaging physicist, certified by the American Board of Radiology in Diagnostic Radiological Physics and Medical Nuclear Physics. He has held faculty positions at the University of Alabama at Birmingham, University of Pennsylvania, and most recently at the University of Pittsburgh. 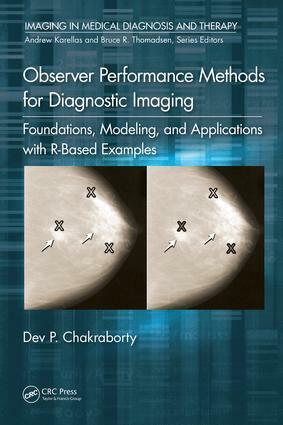 "As opposed to most of the books with a primary statistical orientation, this book presents the technology evaluation methodology from the point of view of radiological physics and contrasts the purely physical evaluation of image quality with the determination of diagnostic outcome through the study of observer performance. The reader is taken through the arguments with concrete examples illustrated by code in R, an open source statistical language." Dev P. Chakraborty received his PhD in physics in 1977 from the University of Rochester, NY. Following postdoctoral fellowships at the University of Pennsylvania (UPENN) and the University of Alabama at Birmingham (UAB), since 1982 he has worked as a clinical diagnostic imaging physicist. He is American Board of Radiology certified in Diagnostic Radiological Physics and Medical Nuclear Physics (1987). He has held faculty positions at UAB (1982 - 1988), UPENN (1988-2002) and the University of Pittsburgh (2002-2016). At UPENN he supervised hospital imaging equipment quality control, resident physics instruction and conducted independent research. He is an author on 78 peer-reviewed publications, the majority of which are first-authored. He has received research funding from the Whittaker Foundation, the Office of Women's Health, the FDA, the DOD, and has served as principal investigator on several NIH RO1 grants.